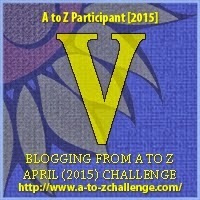 Last year in the A to Z I did V is for Vernier Scale, as I was desperately avoiding the obvious... it was my least popular post of the challenge! This year I had resigned myself to cover Valentines as there are plenty of beads to show you for this. I've already shown you one in L is for Love Hurts which was a fabulous Valentine's Release by Ohm Beads, there's my RAF Benevolent Fund bead (shown above) which is very dear to my heart, another Valentine's Day Release, this time by Trollbeads, and bought in memory of my Father-in-Law who'd passed away the year before. However, late one night as I was going to bed last week I got hit with an obvious stick, repeatedly... I actually have the MOST AWESOME V bead which hadn't occurred to me until now. Velociraptor from Ohm Beads Rawr Collection. You can read all about my Dinosaur beads in detail here and how I swapped my car for them - but for today, V is most definitely for Velociraptor! P.S. I still don't have a Vernier Calliper!! I seem to struggle with V... any suggestions for next year? I don't know very much about beads, but you could do Vermilion, or Variegated, or Virtuoso (to tell everyone how very good you are at beading ;P), or Vert (yes, foreign words are allowed, honest, we have one for Z on Wittegen Press). How about the Venus of Willendorf bead? Now retired I think. I love those dinosaur skulls and they really have such a greater impact when you see them all together :) You've got some great glass with them too. Ooh some more great V ideas... brilliant! It's so nice to find someone else with a love for vampires :) Have you been reading Timothy Brannan's posts (386 on the list)? They're all about vampires this year. Ooh no I haven't, got behind with my A to Z reading as life outside the Internet has been stupidly busy, I almost didn't do the A to Z as I wasn't sure I could write all 26 posts in good time! Thanks for heads up, got some time early this week so will head over there tomorrow to have a good nose! Really amazing, especially for someone like me who is fascinating by all kinds of beads! Thanks Mary, I never get tired of showing these beads, the dinosaure skulls are just genius! A lot of brands would have hit them with a cute/cartoon stick or made them more bead/chain friendly, I *love* that Ohm just made them as dinosaur skulls with no meddling, just great design! Who doesn't like a good velocaraptor? I know I do! Yep, I can't believe I almost forgot about what an awesome V bead I had... I blame working to hard at the day job... almost missed a V scoop! Thanks Amanda, so glad I got hit with the obvious stick, I would have been kicking myself for months if I hadn't realised in time! I'm scratching the surface as I only tend to blog what I like... and in this A to Z I've missed out a lot on the gemstone beads and not featured many silver either... but then I guess I have a whole blog and all year around to do that! Thanks Allison, there really are a lot of great design teams out there who don't do the predictable "girly dainty pink princess" type beads, not that there's anything wrong with the former if that's what you like, variety is good! But now you can get beautifully made, dinosaurs, skulls, dragons etc for grown ups. The silver dinosaurs are all by Ohm Beads, T-Rex has been around for about a year but the other 3 including Velociraptor were released in January. The glass beads I used in the dinosaur bracelet are all Trollbeads, and are a mix of production glass and uniques (milan, florence and purple mosaic are the "production beads" plus there are two uniques in there) and semi-precious stones (labradorite & green jasper).the chain and lock are also Trollbeads. I never used to wear many bracelets until I discovered modular jewellery, now I can wear whatever I like - I have small wrists so being able to buy the length of chain etc I need and personalise to my own taste has seen my bracelet wearing days rocket!